"Olivado Extra Virgin Avocado Oil is quite simply, the juice of the first, cold pressing of New Zealand's finest quality ripe Avocados. We can call it Extra Virgin because its pressed at temperatures below 50 degrees Celsius and contains an acid content of 0.2%, far below the 1% required for the Extra Virgin designation. In addition, no heat or solvents are ever used to extract the oil from the fruit. 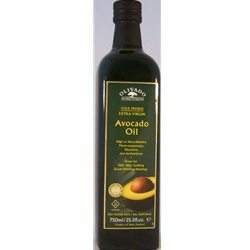 Due to its high chlorophyll content, Avocado oil is very unstable and can degrade very quickly, so after extraction the Olivado subjects the oil to a unique and natural process that completely stabilizes it, retaining the goodness for up to 2 years in an unopened bottle. The oil has the rich, buttery, delicate taste profile of ripe Avocados that Americans have grown to love over the years. And because many of us have been raised on a diet of dairy products it's a taste that is very familiar to us. In turning the avocado into oil, Olivado has maintained all the health properties of this most nutritious wonder fruit, in a delicious, versatile, shelf stable oil that can be used as an alternative to olive oil in any recipe. Unlike some strong olive oils, Olivado Extra Virgin Avocado oil is never bitter, will not burn at moderate temperatures and won't overpower your recipes. It has excellent health benefits, including monounsaturated fat (the good fat), has no cholesterol, no carbohydrates, and can be used as an essential component of the new Mediterranean Diet." Kosher, No Trans Fats, All Natural, High in Mono-unsaturates, Nutrients, and Antioxidants. Great for High Heat cooking, Salads-Drizzlings-Dressings.